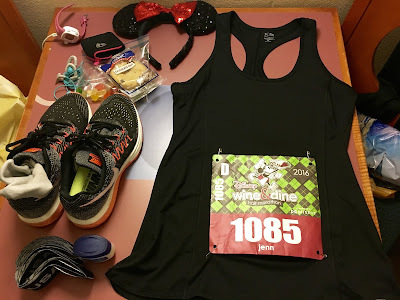 I have this consuming fear that one day I'm going to go to the runDisney race expo, pick up my packet, and leave... then unpack my bag hours later and, in assembling my race gear, discover I FORGOT SOMETHING. Walt Disney World is both wonderful and weird in that you can't readily access the outside world when you're there. In my nightmare hypothetical, my first instinct was to freeze and freak out, because if the expo is closed, where can I possibly go to get running-related items??? Five minutes calm thinking can lead you to what is probably the obvious conclusion to everyone but high-anxiety me: there are multiple potential solutions here, Captain Panicky. First off, if Disney Springs is still open, you could hit up Fit2Run for more nuanced items like specialty running shoes, GPS watches, KT Tape, energy foods, and the like. Multiple clothing stores may offer gear as well. Then there's the ultimate panacea: take an Uber/Lyft to a Walmart or Target. A lot of them are open as much as 24 hours and while they may not have precisely what you want, if you wake up at 1am in a cold sweat because you just realize you didn't pack a single pair of socks this will do the trick. And since they have such a huge selection, they're bound to have a stopgap item. Finally, if you happen to know somebody else who's down for the run, see if they have something you can borrow! Heck, you could even hop on Twitter or Facebook and beseech assistance from your fellow running strangers. I find they're usually pretty nice. Above all, remember the wise words of Douglas Adams: Don't Panic.